Can we all agree that life isn’t perfect? That we all long for something that we don’t have? That we all struggle with something shameful and hard? In the last few months, I have cried out to God and reached into His grace and strength over and over again. Life changes so quickly, words swim around like darts, and life–in all its complexities– can overwhelm, perplex, and stifle the hope and joy within. And while these feelings of suffocation are momentary, sometimes lasting an hour or a day, they still come over you as real as pain, as debilitating as sickness. We cannot escape it, for pain will never abandon us. We do not have to be in the midst of a great fire to experience the heartbreak and struggles of life. It is simply there each day, waiting for us, asking us to succumb to it, to give up hope, to fall in discouragement. But in the last few months, every time I have fallen in despair, I have sought God in the depths. And He was there with me. Furthermore, I was brought out, washed in hope, clothed in grace, and abundantly given strength. I could not despair for long or sink beneath the weight of even the smallest struggle, for God was there….always offering, always giving, always holding, always loving. I simply had to cry out in my desperation and accept the Truth. Today, I felt the overwhelming restlessness well up into my heart again, and I knew it was time to write about it, because haven’t we all struggled in the last few months? Haven’t we all cried? Haven’t we all fought and failed? Haven’t we all wrestled with our hearts and grieved in our souls? And while I rejoice in the hope I have in Christ, and while I trust Him with my life….my heart writhes within. I struggle! I envy! I choose sin! 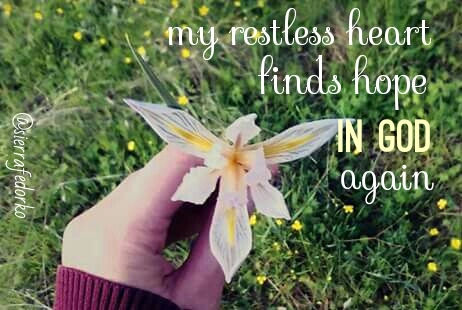 I am a Christian with a restless heart. I am a Christian continuously, earnestly surrendering my heart and my expectations. I am asking and receiving God’s forgiveness every day. I am fighting for what I desire, then surrendering to what God desires. And His ways are best! I find joy within it, simply because God shows Himself great. I find hope despite it, simply because God knows my story. I find rest where I could not imagine rest to be. This is the Christian life! It is restlessness becoming rest. It is selfishness becoming forgiveness. It is hate becoming love. It is discontentment becoming JOY. It is sorrow becoming hope. It is the fire that brings the healing and the struggle that holds the promise. It is the heart choosing surrender to God over and over and over again. It is beautifully monotonous, and at times, unbearably hard. But surrender to God always brings ultimate joy. Doubt dissipates, fear runs to hide, and I can break out of my restless heart. 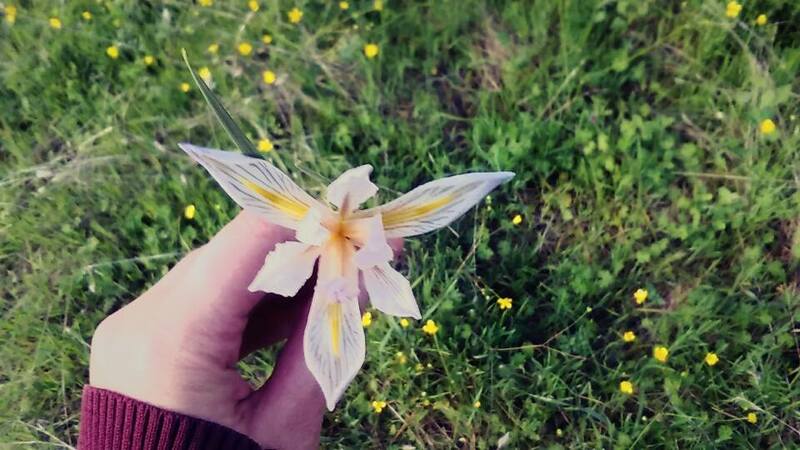 Like a flower that boldly blooms in the springtime, I push above the hard and wounded surface to trust God with my life. The feeling of suffocation cannot withstand the promises of God. So today, I felt overwhelmed…the hardness of life sinking deep, but God was there to show me the way out. And maybe in 5 minutes, I will feel overwhelmed again. But God will be there….. He never leaves, and while my heart may twist in restlessness, it cannot do so for long. Because my heart is never unreachable to God. He gives Rest abundantly full. Life is hard, we can all agree, but the restless Christian heart cannot win for good. Because God gives hope where loss once lay. He gives rest where we cannot imagine it to be. He grants grace when we do not deserve it ,and heals the heart in ways we cannot understand. Today I am not defeated! I walk away free. I walk away whole. I walk away rested. And only because of God. Amen, Rose! Everything you said! I love the truth “grace upon grace!” God is SO good. The pain, hardship, hope, joy, journey….EVERYTHING is worth it! This is every Christian’s struggle. What would we do without the Lord? It is a daily struggle to trust and obey! Thanks for this wonderful reminder! I am so thankful for God’s grace and the friendship of other believers! I praise God for you, Ann! Thank you for this, Sierra! You are welcome, Amber! I’m glad God could use it for your encouragement. He IS good!